I'd expect a goblin sword to be pretty rusty, they aren't known for using new, well maintained equipment. I can't say I'm a fan of the sword either, it just doesn't look like something anyone would really use. I am also disliking the sword, I think it is over-scaled. I think half the width would be better, but as previously stated an iron sword looks out of place, perhaps a stone axe would fit better? Also, I think the head is a tiny bit too big. "I'd like to live just long enough to be there when they cut off your head and stick it on a pike as a warning to the next ten generations that some favors come with too high a price. I'd look up at your lifeless eyes and wave like this. Can you and your associates arrange it for me, Mr. Morden?" We'll find out soon enough eh. Rusty. But I'm mostly interested in size comparisons to existing Goblin models from elsewhere. I need to acquire plastic Skavenslaves, can you help? I have a blog now, evidently. Featuring the Alternative Mordheim Model Megalist. We'll have these made available too. Yes, please change the sword. Go with a rusty sword of you must, but small axes would fit the theme much better. Rusty seems more appropriate. 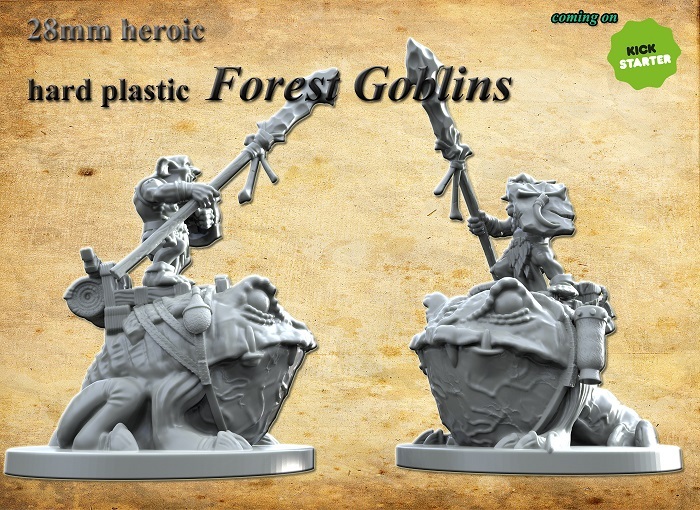 Though, as many have mentioned, forest goblins seem a bit too low tech to have metal swords, at least, not ones that nice (rusty or not, it was well made from the look of it). I supposed they could have looted it, but for a little goblin, that would be a pretty heavy weapon. Wooden spears, and cut glass & stone seem more appropriate, but, that's just me. 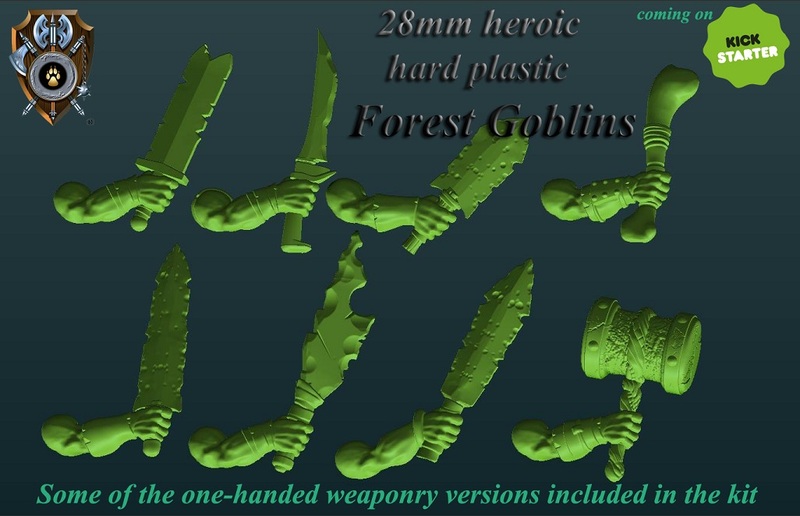 I suppose you could have the sprues set up to make forest as well as 'common' goblins, which would make the sword much more understandable. Glad to see you're going to give the forest goblins another go, I was sorry that last KS with them didn't finish. I still think these Confrontation goblins had the right amount of tech when it came to weapons. Cutlery tied to sticks. Perfection. They should absolutely have garbage tier weapons cobbled together from junk. Poorly lit photos of my ever- growing collection of completely unrelated models! Watch and listen to me ramble about these minis before ruining them with paint! 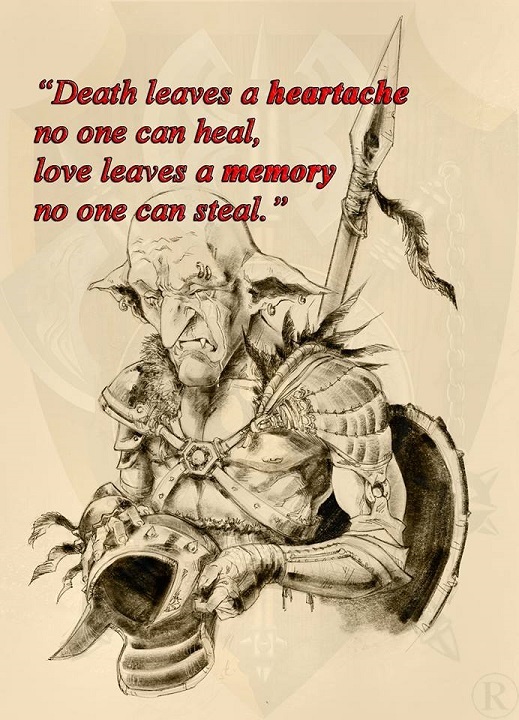 Our background stories have the 'common' goblins and the Forest Goblins as a one single faction. In times of war the 2 goblins factions would exchange some weaponry between them, but most of the weapons we have for the Forest Goblins are indeed low tech/primitive/scavanged. All goblins however hate everyone else (especially humans and Orcs), and serve as a mercenary faction for gold is always welcome. Nasty and greedy folk nonetheless. 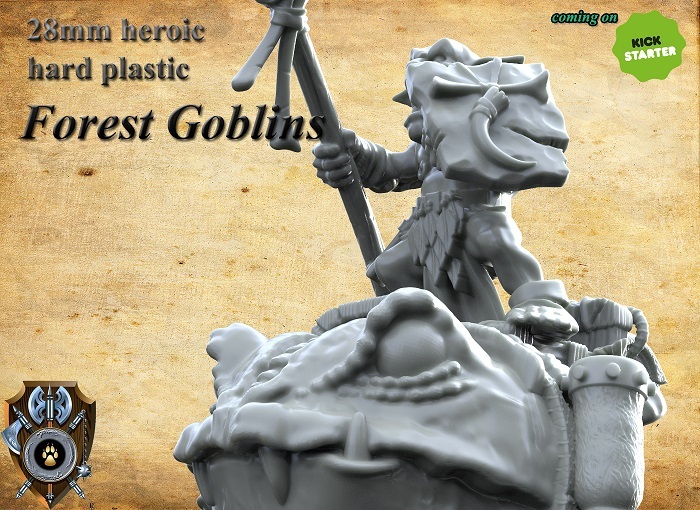 We have a different army planned for the 'common' goblins as a SG (thus they will have a separate plastic kit). They are master engineers and have created some awesome tech kits. Today we were supposed to show the second of many teasers/works we have prepared for our Goblins Kickstarter. It won't be today either, as we are taking a whole week of leave. 2018 ended with the worst possible way. The loss of a father's guiding hand takes time to heal. Urusei Yatsura, Cerebus the Aardvark, Machiavelli, Plato and Happy Days. So, how was your childhood? My condolences. I wish I knew what else to say. My condolences as well. I lost my father in July. His birthday, thanksgiving and Christmas were all really difficult to handle without him. We appareicate that guys. Time is the only medicine we are going to need for this. In the meanwhile, life goes on. We are now moving forward (with a couple of weeks out of inital schedule) with the Goblins Kickstarter, which helps pull our mind from the recent events. We will be posting images and info of the new project every few days for the next month, plus making available a preview page of the project late this month to get better feedback. This time every kit starts with every option available. Forest Goblins, Common Goblins and Sci-fi Goblins. 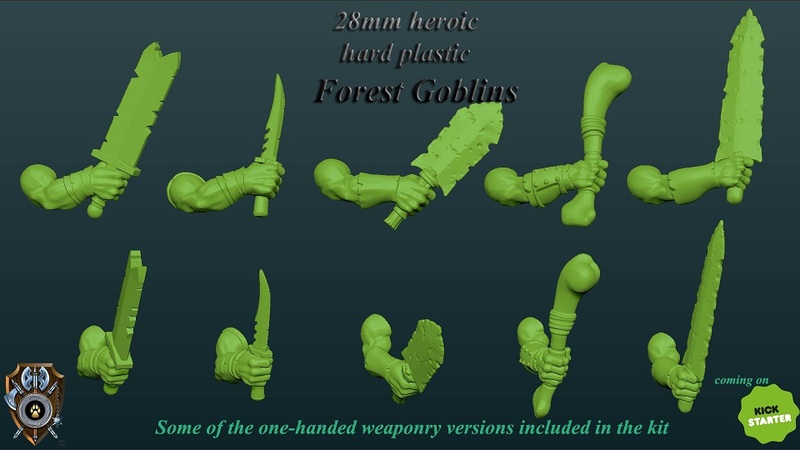 Here we are showing some of one handed weaponry planned for the Forest Goblin kit. I love the Bone and the Knife. Swords are still a bit Chunky for my tastes though. Looking good cant wait to see the full sprues. Any word on those Arachnopeople? We are looking on how we can have them done in plastic. If we don't succeed, there's going to be the release in resin. Here are a couple more of the one-handed weapons. I like the wide swords, but you shouldn't give much weight to my opinion since I'm not a goblin fan. I think the mallet is oversized and at least needs a longer handle. 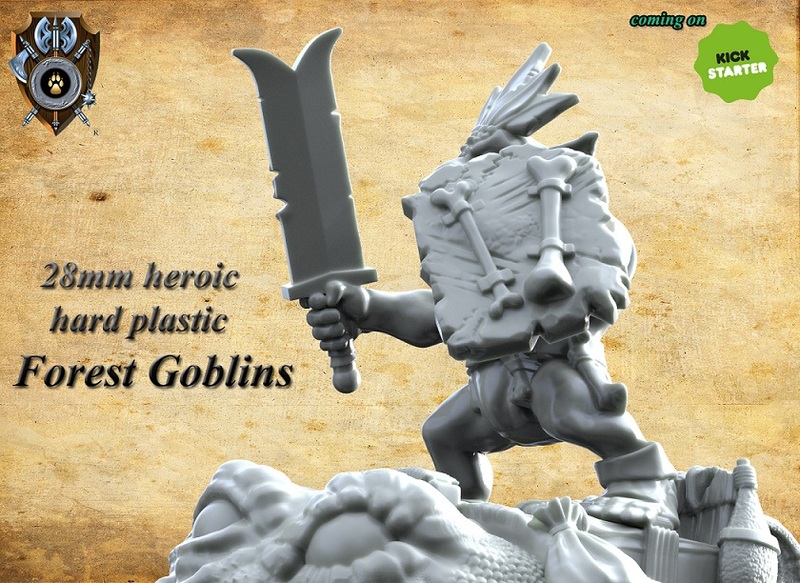 Any chance of a size comparison next to other popular manufacturers' goblins? My scratch-building and kit-bashing log. Or even the Shieldmaidens or Sisters- at least with only Shieldwolf figures even that would give us a good baseline of what size to expect. Nah I'm gonna want to see actual gobbo-on-gobbo action. There’s always *something* about shieldwolf’s minis that puts me off. These weapons just don’t fit with primitive forest goblins imo. Needs more flint (and a little less exaggerated size). They must be ugly (or self conscious about their looks) as each picture has them blocking their faces with shields. We'll make comparison pictures available with miniatures from other manufacturers. First let me thank you as we appreciate the interactiona dn feedback. 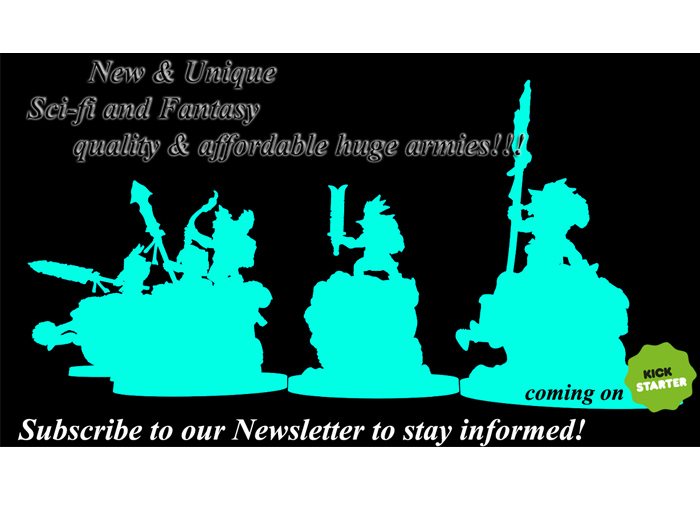 The relaunch is way better prepared compared to the first project; this time we have sculpted everything that will be included in the final sprues so things are crystal clear, apart from us augmenting the cofunding of the project itself. I think you'll be pleased to know there's an abundance of primitive looking weaponry, but we also took care of adding abbandoned, looted, broken weaponry to capture the essence of the Goblins arming themselves with whatever possible. If it's good enough to kill, it's good enough to bring to the battlefield. If this doesn't convince you, hopefully the common and/or sci-fi goblins will have better luck, but Forest Goblins were promised first and we always keep our word.